He spoke on the eve of a meeting in Austria where Theresa Mayon Wednesday night will appeal directly to her 27 fellow EU national leaders to accept her government’s blueprint as the best outcome for Europe as well as the UK. The European Commission is aiming for a final deal to be struck at an emergency summit in November, four months before Britain leaves the bloc on March 29 next year. 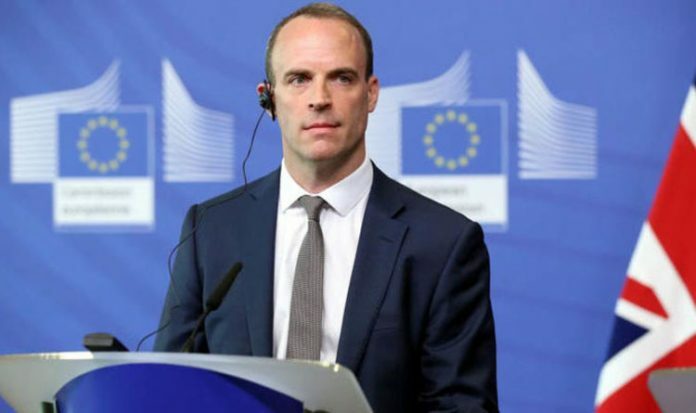 Mr Raab, who has been spearheading talks with European Commission chief negotiator Michel Barnier, told journalists from German, French, Irish and other EU countries: “We’ve made the compromises and we showed the ambition and we do need to see that matched on the EU side. The gathering in Austria was “an important milestone, a stepping stone, to show that we’ve actually got the contours of agreement on principles to continue the final weeks of these negotiations and hammer out the details”. Mr Raab made clear the UK seeks further movement from the EU on how to keep the border between Ireland and Northern Ireland free-flowing after Brexit. Mrs May’s trade plan for goods was the only one so far that guaranteed smooth commerce between Britain and the EU and took account of Ireland’s particular situation, he said. Britain could not accept the EU suggestion that effectively created a customs border between Northern Ireland and mainland Britain by keeping only Ulster in the EU customs area, he stressed. Unnamed EU diplomats were reported in the Guardian as insisting it was for Britain to make “substantial” further compromise. One even claimed Britain needed a “darkest hour” moment facing a no-deal Brexit to be made to shift position – using the term coined by Winston Churchill for the early days of World War II when the British Empire and Commonwealth stood alone against Nazi Germany. But Foreign Secretary Jeremy Hunt today struck a more upbeat note. On an official visit to Japan he said Britain could leave the EU next March without a deal: “But I don’t think it’s in anyone’s interest for that to happen. He was “confident” the Prime Minister would succeed with the EU, despite Tory attacks on her plan. “British politics is littered with the graveyards of people who have predicted the demise of Theresa May and been proved wrong. So I think she will succeed,” said Mr Hunt. Mr Hunt was the first British government minister to make a speech in Japanese, which he learned in the country as a young man in the 1990s. He was on guard to avoid a repeat of his gaffe in China earlier this year when he tried to impress his hosts with the information that his wife is Chinese, only to refer to her by mistake as Japanese. Theresa May will warn EU leaders that Brussels must offer concessions to the UK to ensure a Brexit deal. She is expected to point out that the UK has “evolved” its position in the talks, so the EU must do the same to get “a successful conclusion”. She will say that “goodwill and determination on both sides” are needed on both sides to avoid a “a disorderly exit” and reach a deal that is in the best interests of both sides. She will also say that neither side in the talks can be expected to breach their “red line” commitments. “Neither side can demand the unacceptable of the other, such as an external customs border between different parts of the United Kingdom. “No other country would accept it if they were in the same situation,” a Government source said ahead of the informal gathering of EU leaders at Salzburg. Mrs May will say the EU must respect the “constitutional and economic integrity” of the UK and so cannot accept any attempt to put a customs border across the Irish Sea. Mrs May will say the UK is proposing “a fair arrangement” that works for the UK and European economies without undermining the EU’s Single Market. She is add that the arrangement will be “balanced by a strong security relationship” to keep all our citizens safe from threats at home and abroad.